Condes can print maps and courses on almost any Windows printer. You can print draft maps for vetting, or you can print multiple maps on the same sheet of paper for "mass production" competition maps. You can print directly from the Course Layout Editor by simply clicking the print icon in the toolbar. Printing directly from the CLE is intended as test prints or proofs for vetting. Condes puts a date and time stamp on these prints, so that you can keep track of when the printout was made. - the area that you have defined as print area. You can preview the printout on the screen before printing. Use the File menu, then select Print Preview. You can also print from the Print menu. Printing from the Print menu gives you more options for the layout, and is intended for final printing. Use the Print menu, and then select Maps with Courses. 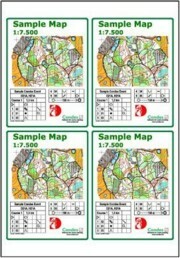 You can print one map on each page, or you can put more maps on the same page to save paper. You can fill the page with copies of the same course, or you can print different courses on the same page. You can align the printout to the top left corner of the page, or you can center the printout on the page. More about the options can be found here. You should be aware that printer quality varies from printer to printer, and not all printers can produce a quality that is sufficiently good for competition maps. The print quality is measured both in terms of printer resolution, i.e. how sharp are the edges of the lines produced, and in terms of correct colour rendering. Print quality is a topic that is discussed extensively, and a full discussion is out of scope for this help topic. There are very good printers out there, and there are very poor printers. It pays off to study this topic a bit before using just any printer to print maps. As a rule of thumb, in general PostScript printers produce the most correct colour quality and is easier to control. When printing on a PostScript printer, Condes can render the map using colors in the CMYK color space that are the native colors of the map. When printing on any other printer, Condes needs to convert the native map colors to the RGB color space. Condes does this as a 1:1 mapping, and does not modify the colors in any other way. The printer's interpretation of the colors are sometimes slightly different that the map's native colors.